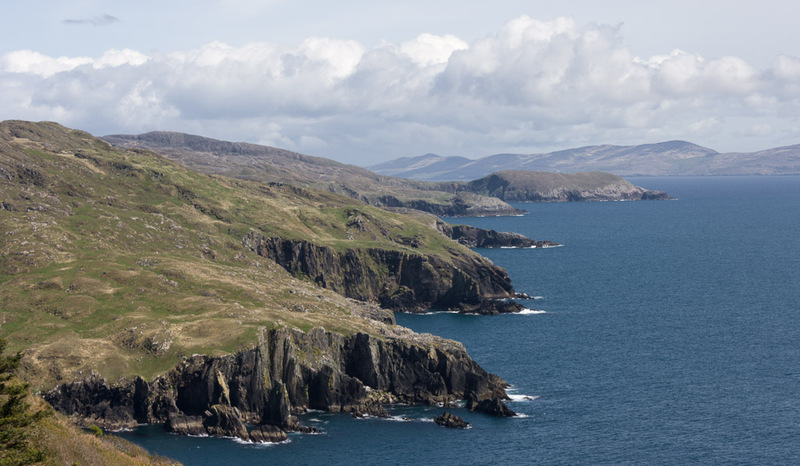 Dzogchen Beara is a place that everyone seems to fall in love with. “Amazing”, “gorgeous” and “unbelievably relaxing” were just a few of the appreciative comments I’d heard friends make after visiting the buddhist retreat centre. As it turns out, the centre really is all of those things. 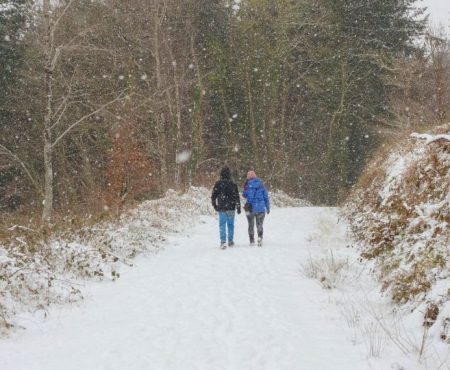 With daily meditation classes, regular retreats, a cliff-top location and a cosy café, it’s understandable why Dzogchen Beara has become one of the most popular destinations for spiritual retreats in Ireland. 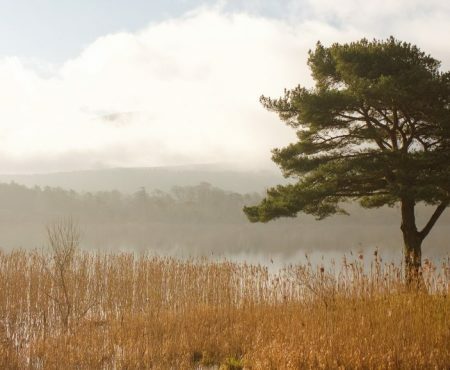 In 1992, Peter and Harriet Cornish donated their 150 acres of rugged farmland to Rigpa – an international network of Buddhist centres and groups. 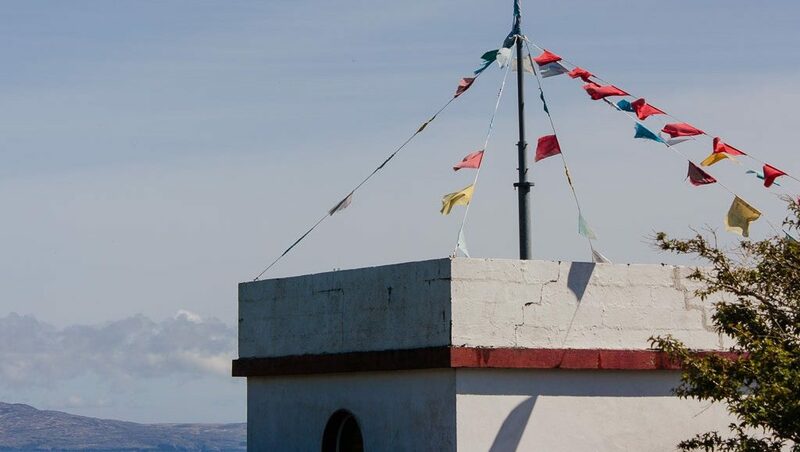 Under the spiritual guidance of Sogyal Rinpoche, the land was transformed into Dzogchen Beara. On the edge of the Beara Peninsula in South-West Ireland, there’s now a cluster of white buildings. Prayer flags and banners billow in the breeze, and the sea is visible from almost everywhere in the grounds. There’s something special about this place, which might be why so many people brave the winding roads to find it. I was lucky to arrive on one of those bright, summer days that Ireland isn’t known for but does so well. It was ideal weather to sit in the silent Meditation Garden – a place where visitors can meditate to their hearts’ content. 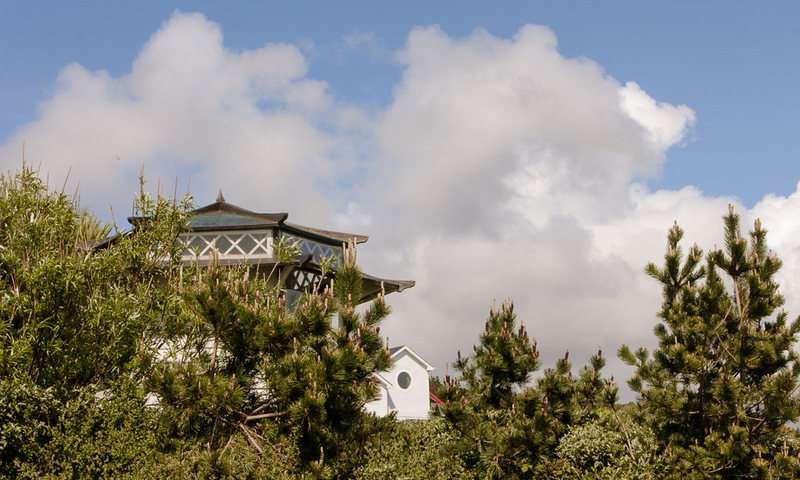 But with its sea views and clusters of white daisies, non-meditators should find the garden equally relaxing. Beyond the Meditation Garden, the River Walk is a marked woodland trail for anyone who wants to continue exploring. Trying to make the most of the sun, I walked over nearby headlands and spent the afternoon hiking the Copper Mine Trail near Allihies. When I went back to Dzogchen Beara the next morning, the weather had taken a miserable turn. Luckily, the views from the retreat centre are equally dramatic in the rain. The Shrine Room, where morning and afternoon meditation sessions take place, is big and airy. Floor-to-ceiling windows give an immense view of the Atlantic, and meditators sit on chairs and comfy floor cushions. The drop-in classes are free unless visitors want to make a donation. Sessions run for 45 minutes and are led by a teacher, so beginners are welcome. The centre also runs retreats and events throughout the year, and the themes vary. There’s a regular buddhist retreat that focuses on ‘Loving Kindness’, and workshops that combine photography with meditation. For post-meditation treats, I cosied up with a coffee in the café. It’s the kind of place where relaxing with a book is encouraged, and where strangers seem to find things to chat about. The best spot is at the table by the picture window, where there’s yet another ocean view. On a sunny day, you can take your cake outside and sit on the leafy terrace. At lunchtime, the café serves vegetarian dishes, which largely consist of organic, homegrown ingredients. But there’s much more to Dzogchen Beara than meditation and chats. The on-site Dechen Shying Spiritual Care Centre is a facility for people experiencing illness, bereavement, or other difficulties. 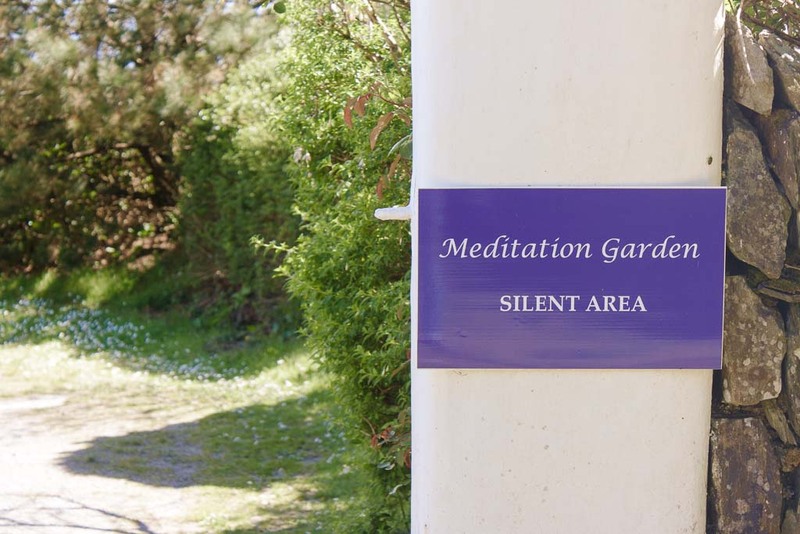 It offers residential programmes and meditative breaks, and it’s just as peaceful as the rest of the Buddhist retreat centre. Visiting Dzogchen Beara was a treat. The friendliness and beauty of the place made me want to book myself into one of the cottages and spend a week recharging. 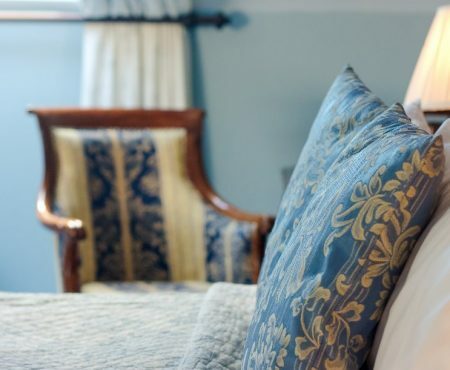 Tucked away in the wilds of West Cork, it’s the perfect place to escape the stresses of life. 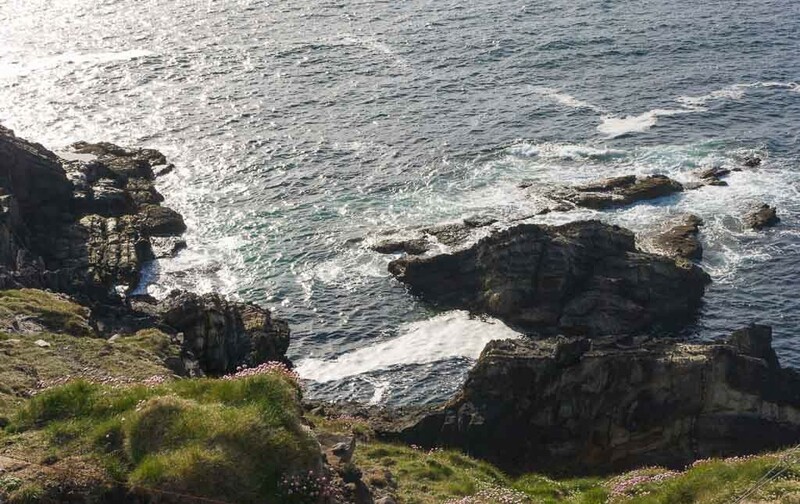 Dzogchen Beara offers some of the most popular Buddhist retreats in Ireland. The nearest villages are Castletownbere (8km) and Allihies (11km). I stayed in the lovely Sea View guesthouse, but Dzogchen Beara also has its own accommodation. If you want to join one of the daily meditation classes, it’s best to call ahead and check first. The afternoon class is sometimes cancelled, due to retreats.